Diamond is rated 4.3 out of 5 stars by customers. Logix® keeps everyday necessities within easy reach, yet tucked out of site. A blend of modern & traditional details. Focuses on personalization & harmony between both styles to create a comfortable & easy living space. The quintessential idea of open spaces and clean lines. Subtle geometric designs and modern materials create a level of elegance. More than just “country”. Conveys a warm and relaxed style that brings the charm of the outside in with natural materials and a variety of textures. Elaborate, rich and decorative, yet elegant & inviting. Uses a variety of colors & materials to project refinement through symmetry & balance. When you choose Diamond, you have access to thousands of stains, paints, glazes and specialty finishes, and the broadest selection of door styles available. Our door visualization tool gives you the freedom to visualize the look of your favorite Intrigue, Reflections or Prelude door in the colors you love. Choose your preferred Diamond series and door style to start dreaming! Using the Diamond Visualizer is fun and can be completed in just five easy steps! ● See your favorite cabinetry and other kitchen finishes in a real space. 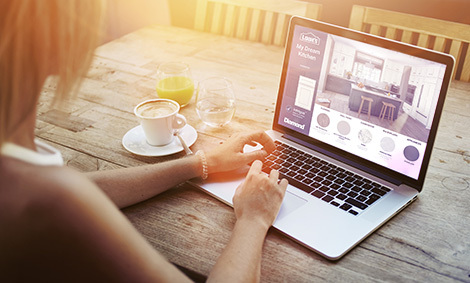 ● Set an appointment with a Lowe’s designer to explore your ideas and learn more. Understandably, this is the most common question cabinet buyers have. When working on a full kitchen renovation with the goal of staying on budget, it’s important to understand how you want to prioritize your line items. Think about the aspects of the renovation you would be willing to sacrifice in order to get exactly what you want in another area. 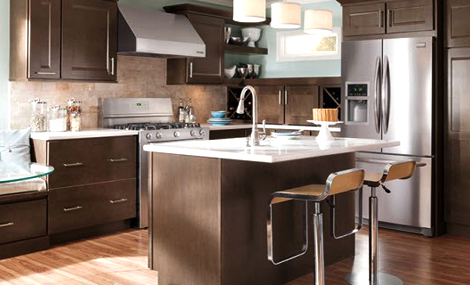 According to the National Kitchen and Bath Association, cabinetry and hardware account for 29% of your kitchen remodeling cost. Use our handy budget estimating tool to get an idea of what your cabinets could cost depending on the size, layout, design and style you choose. The Diamond family of cabinetry provides the beautiful color customers want, the craftsmanship they expect, and the service they deserve.